Introduction: Thoracolumbar spine trauma is the most common site of spinal cord injury, with clinical and epidemiological importance. Materials and Methods: We performed a comprehensive literature review on the management and treatment of TLST. Results: Currently, computed tomography is frequently used as the primary diagnostic test in TLST, with magnetic resonance imaging used in addition to assess disc, ligamentous, and neurological injury. The Thoracolumbar Injury Classification System is a new injury severity score created to help the decision-making process between conservative versus surgical treatment. When decision for surgery is made, early procedures are feasible, safe, can improve outcomes, and reduce healthcare costs. Surgical treatment is individualized based on the injury characteristics and surgeon's experience, as there is no evidence-based for the superiority of one technique over the other. Conclusions: The correct management of TLST involves multiple steps, such as a precise diagnosis, classification, and treatment. The TLICS can improve care and communication between spine surgeons, resulting in a more standardized treatment. Context: The function of the upper cervical spine (UCS) is essential in the kinematics of the whole cervical spine. Specific motion patterns are described at the UCS during head motions to compensate coupled motions occurring at the lower cervical segments. Aims: First, two methods for computing in vitro UCS discrete motions were compared to assess three-dimensional (3D) kinematics. Secondly, the same protocol was applied to assess the feasibility of the procedure for in vivo settings. Also, this study attempts to expose the use of anatomical modeling for motion representation including helical axis. Settings and Design: UCS motions were assessed to verify the validity of in vitro 3D kinematics and to present an in vivo procedure for evaluating axial rotation. Materials and Methods: In vitro kinematics was sampled using a digitizing technique and computed tomography (CT) for assessing 3D motions during flexion extension and axial rotation. 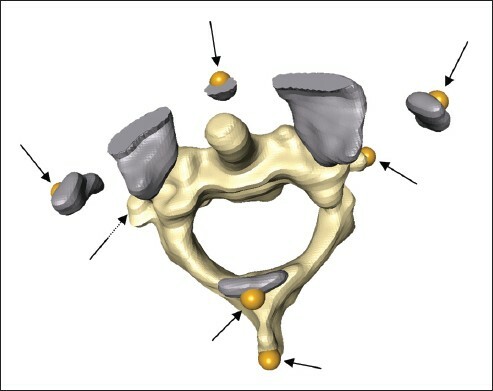 To evaluate the feasibility of this protocol in vivo, one asymptomatic volunteer performed an MRI kinematics evaluation of the UCS for axial rotation. Data processing allowed integrating data into UCS 3D models for motion representation, discrete joint behavior, and motion helical axis determination. Results: Good agreement was observed between the methods with angular displacement differences ranging from 1° to 1.5°. Helical axis data were comparable between both methods with axis orientation differences ranging from 3° to 6°. In vivo assessment of axial rotation showed coherent kinematics data compared to previous studies. Helical axis data were found to be similar between in vitro and in vivo evaluation. Conclusions: The present protocol confirms agreement of methods and exposes its feasibility to investigate in vivo UCS kinematics. Moreover, combining motion analysis, helical axis representation, and anatomical modeling, constitutes an innovative development to provide new insights for understanding motion behaviors of the UCS. Introduction: Low backache (LBA) is one of the most common problems and herniated lumbar disc is one of the most commonly diagnosed abnormalities associated with LBA. 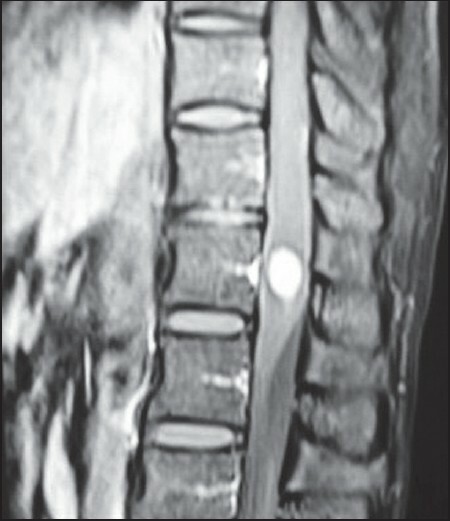 Disc herniation of the same size may be asymptomatic in one patient and can lead to severe nerve root compromise in another patient. Objective: To evaluate correlation between the clinical features of disc collapse and magnetic resonance imaging (MRI) finding to determine the clinical importance of anatomical abnormalities identified by MRI technique. Summary: From January 2010 to January 2012, 75 otherwise healthy patients (43 males 32 females) between the age of 19 and 55 years (average age was 44.5 years) with low back pain and predominant complaint of root pain who presented to our clinic were included in the study. Materials and Methods: Proper screening was done to rule out previous spine affection and subjected to MRI. Results: The results were analyzed under four headings viz. disc herniation, disc degeneration, thecal sac deformation and neural foramen effacement. All patients had a visual analog score (VAS) score more than 6. The interrater correlation coefficient kappa was calculated to be k=0.51. 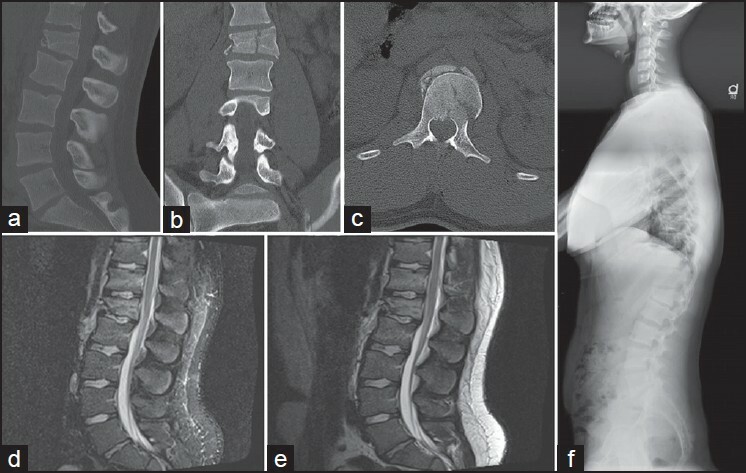 There were total 44 patients with herniation, 25 patients had mild, one patient had moderate degree of thecal sac deformation, 21 patients had one or more levels of foraminal effacement by the herniated tissue, 100% of the patients had disc degeneration ranging from grade 1 to 3 at different levels; and 48 patients (64%) had radiculopathy, six (8%) patients had bilateral and others had ipsilateral affection. Conclusion: In our study, the correlation was made between clinical findings and MRI findings. It can safely be concluded that treating physician should put more emphasis on history, clinical examination, and make the inference by these and then should correlate the clinical findings with that of MRI to reach a final diagnosis. Aims: Determining the source of low back pain (LBP) is still controversial. This study was designed to determine the source of LBP and its relations with age and gender. Settings and Design: A retrospective chart review at Isfahan University of Medical Sciences, Isfahan, Iran. 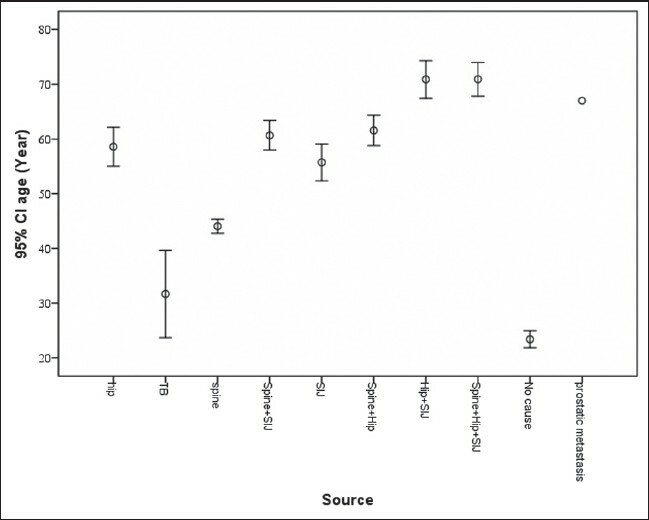 Materials and Methods: A total of 1,125 patients were evaluated to determine the sources of their LBP with physical examinations, imaging, injections, and other laboratory examinations, if needed. The patients were divided into five groups based on their ages. Frequencies of the sources of pain were assessed in the five age groups, and the assessments were done separately by gender. Statistical Analysis Used: Independent t-test, analysis of variance (ANOVA), chi-square test. Results: The patients enrolled in this study consisted of 527 males (46.8%) and 598 females (53.2%). The frequencies of the sources of pain were, in descending order, spine (689, 61.2%), no cause found (163, 14.5%), spine with sacroiliac joint (SIJ) (72, 6.4%), spine with hip (65, 5.8%), SIJ (60, 5.3%), hip (44, 3.9%), spine along with hip and SIJ (20, 1.8%), hip with SIJ (8, 0.7%), and other diseases (4, 0.4%). There were significant statistical differences between the genders and mean ages for different sources (P = 0.03 and 0.000, respectively). Conclusions: This study showed that the spine was the main source of LBP in all age groups. Physicians should always be alert for other sources in middle-aged and older patients. Future studies with long-term follow-up for determining the benefits of treatments are warranted. Background: Posterior ligamentous complex injuries of the thoracolumbar (TL) spine represent a major consideration during surgical decision-making. However, X-ray and computed tomography imaging often does not identify those injuries and sometimes magnetic resonance imaging (MRI) is not available or is contraindicated. Objective: To determine the diagnostic accuracy of the ultrasound for detecting posterior ligamentous complex injuries in the TL spine. Materials and Methods: A systematic review was carried out through four international databases and proceedings of scientific meetings. The pooled sensitivity, specificity, positive likelihood ratio, negative likelihood ratio, diagnostic odds ratio, and their 95% confidence intervals (CIs) were estimated, by using weighted averages according to the sample size of each study. Summary receiver operating characteristic was also estimated. Results: A total of four articles were included in the meta-analysis, yielding a summary estimate: Sensitivity, 0.89 (95% CI, 0.86-0.92); specificity, 1.00 (95% CI, 0.98-1.00); positive likelihood ratio, 224.49 (95% CI, 30.43-1656.26); negative likelihood ratio, 0.11 (95% CI, 0.05-0.19); and diagnostic odds ratio, 2,268.13 (95% CI, 265.84-19,351.24). 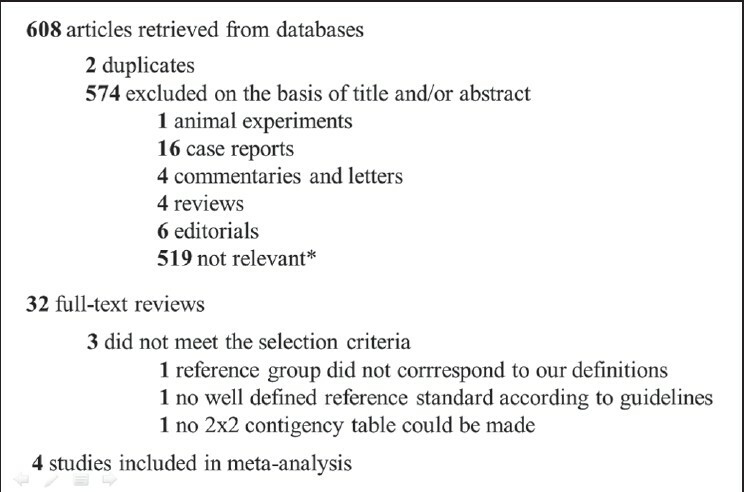 There was no statistically significant heterogeneity among results of included studies. Summary: Receiver operating characteristic (±standard error) was 0.928 ± 0.047. Conclusion and Recommendation: The present meta-analysis showed that ultrasound has a high accuracy for diagnosing posterior ligamentous complex injuries in patients with flexion distraction, compression, or burst TL fractures. On the basis of present results, ultrasound may be considered as a useful alternative when magnetic resonance imaging (MRI) is unavailable or contraindicated, or when its results are inconclusive. 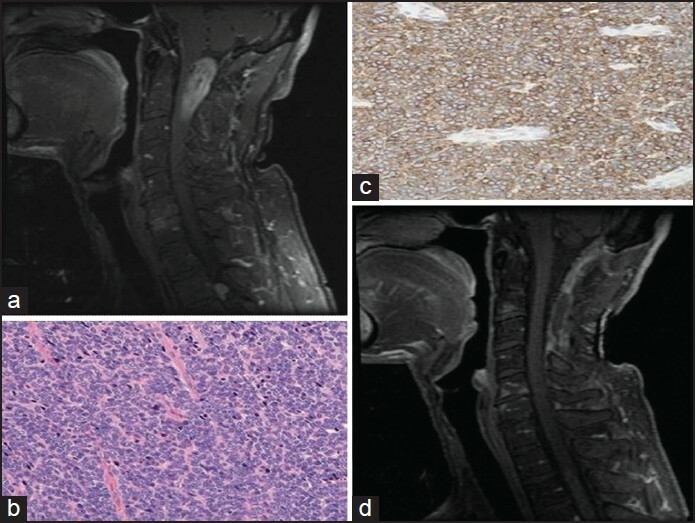 Occurrence of hemangiopericytoma (HPC) in the central nervous system is rare. 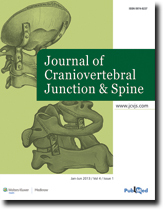 Spinal HPCs with intramedullary involvement are even more unusual. We present a case of a craniovertebral intradural HPC with both extra- and intra-medullary extensions. 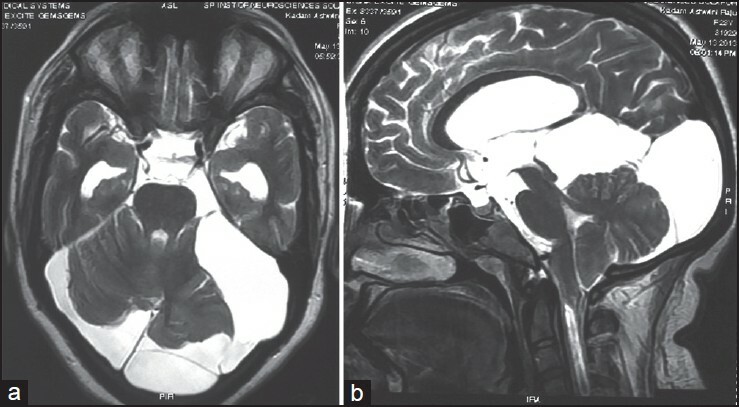 Though the patient presented with vague cervical symptoms, imaging was indicative of an intradural lesion from the occiput to C4 and a second smaller, subclinical lesion, at the T2-3 level. He underwent gross total surgical resection of the craniovertebral lesion and did well post-operatively. The thoracic lesion was treated with radiosurgery and the patient is neurologically at baseline 5 years later. Gross total resection of HPCs is the recommended treatment when possible. Histopathology is crucial for diagnosis due to both its rarity and similar characteristics to other tumors on physical and radiographic evaluations. Recognizing that these uncommon tumors can occur with both extra-medullary and intra-medullarly locations are important for diagnosis and treatment recommendations. Future studies using national surgical databases that contain histology will be needed to understand the long-term clinical outcomes. The authors report an unusual case involving a 70 year old man who came with severe low back pain radiating to both legs, magnetic resonance imaging (MRI) lumbosacral spine reveled nodular spinal intradural lesions involving Cauda equina for which he was operated. Histopathological examination of the operative specimen revealed large granulomas with multinucleate giant cells lining zones of necrosis and within the granuloma numerous septate branching hyphae of Apsergillus spp highlighted by Gomori methenamine silver stains which was suggestive of aspergillosis. There is no reported case of Cauda equina aspergilloma in an apparently immunocompetent person before this. An 8-month-old male infant had presented with a history of a fall from the crib a fortnight ago. He had developed progressive weakness of both lower limbs. On examination, the infant had spastic paraplegia. 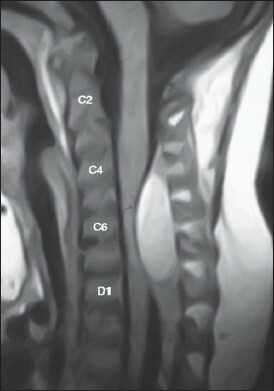 Magnetic resonance (MR) imaging of the cervical spine showed an epidural hematoma extending from the fourth cervical (C4) to the first dorsal (D1) vertebral level with cord compression. The patient had no bleeding disorder on investigation. He underwent cervical laminoplasty at C6 and C7 levels. The epidural hematoma was evacuated. The cervical cord started pulsating immediately. Postoperatively, the patient's paraplegia improved dramatically in 48 hours. According to the author's literature search, only seven cases of post-traumatic epidural hematoma have been reported in pediatric patients, and our patient is the youngest. The present case report discusses the etiopathology, presentation, and management of this rare case. A 46-year-old male presented with progressive paraparesis and sensory impairment in both lower limbs since 2 months. He had urinary and bowel incontinence. On examination he had flaccid paraplegia with a sensory level at 11 th dorsal vertebral level. 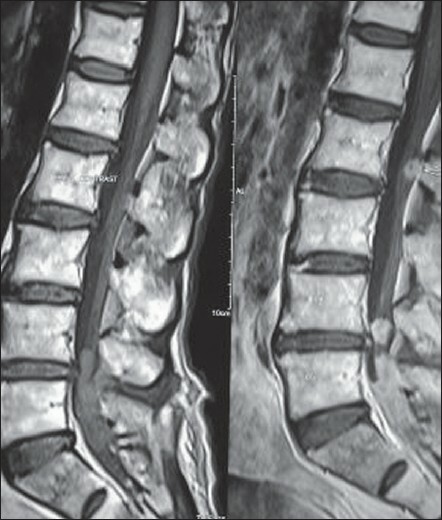 Magnetic resonance imaging (MRI) scans of the lumbosacral spine showed an enhancing intramedullary lesion in the conus. The patient underwent excision of the conus mass. Histopathology confirmed the tumor to represent a poorly differentiated metastatic carcinoma from an unknown primary. A positron emission tomography-computed tomography (PET-CT) scan of the whole body revealed hypermetabolic activity in the hilum of the right lung confirmed to be a lung carcinoma on a CT-guided biopsy. The patient was undergoing chemoradiation at 1 month follow-up. The author's literature search has yielded only four other case reports of conus metastasis of which only one is in English literature. The present case report and review of literature are presented. Acquired cerebellar tonsillar herniation and syringomyelia associated with posterior fossa mass lesions is an exception rather than the rule. In the present article, we describe the neuroimaging findings in a case of 28-year-old female patient presented with a history of paraesthesia involving right upper limb of 8-month duration. Magnetic resonance imaging showed a giant retrocerebellar arachnoid causing tonsillar herniation with cervical syringomyelia. The findings in the present case supports that the one of the primary mechanism for the development of syringomyelia may be the obstruction to the flow of cerebrospinal fluid causing alterations in the passage of extracellular fluid in the spinal cord and leading to syringomyelia.